The UN General Assembly's Open Working Group (OWG) on Sustainable Development Goals (SDGs) forwarded to the Assembly its proposal for a set of 17 goals with 169 targets at the final session on July 19th. The proposal covering a broad range of sustainable development issues, including: ending poverty and hunger, improving health and education, combating climate change and etc. International organizations, governments, the private sector, and NGOs have shown great enthusiasm and willingness to work together for people and planet during the negotiation process. Happily, most of the goals we pursued are included in the 17 goals. This year is the international year of Small Island Developing States and there will be a Climate Summit in UN on 9/23. 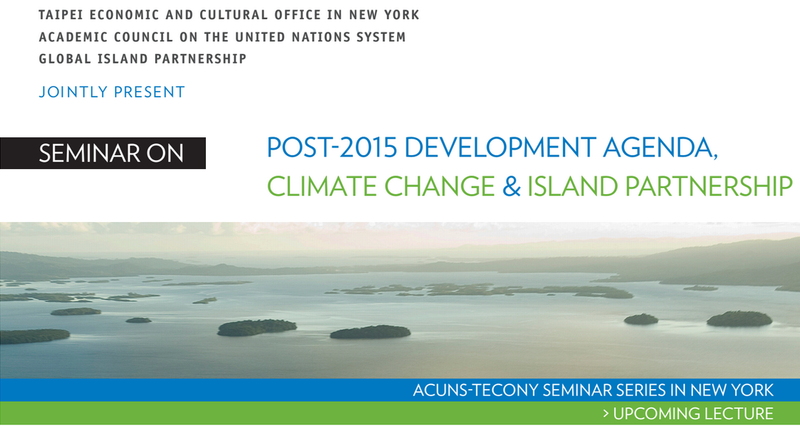 The Taipei Economic and Cultural Office in New York, the Academic Council on the United Nations System and the Global Island Partnership are co-hosting a seminar on “Post-2015 Development Agenda, Climate Change and Island Partnership” at the TECO New York office on September 22 from 2-5pm. We look forward to your participation and exchange of views and experiences.